Provides an overview of pastoral and practical theology in the form of articles and extracts with commentary. The Revd Dr James Woodward is Master of the Foundation of Lady Katherine Leveson, Temple Balsall, and is the Bishop's Advisor for Health and Social Care in the Diocese of Birmingham. Dr Stephen Pattison is currently Senior Research Fellow in Pastoral Theology, University of Wales, Cardiff. John Patton is Professor of Theology at Columbia Theological Seminary, Georgia. Introduction: How to Use This Book. 1. 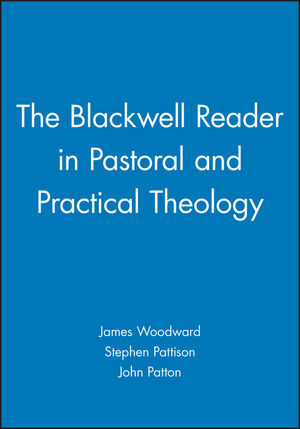 An Introduction to Pastoral and Practical Theology: Stephen Pattison (Cardiff University) and James Woodward (Foundation of Lady Katherine Leveson). Part I: Modern Pastoral and Practical Theology in Historical Perspective:. 2. The Meaning and Importance of Pastoral Theology: Seward Hiltner (Formerly Yale University). 3. Introduction to Pastoral Theology in the United States: John Patton (Columbia Theological Seminary). 4. The Emergence of Pastoral and Practical Theology in Britain: Paul Ballard (Cardiff University). Part II: Approaches and Methods in Pastoral and Practical Theology: . 5. The Nature of Practical Theology: Alastair Campbell (University of Bristol). 6. Pastoral Theology in a Pluralistic Age: Don Browning (University of Chicago). 7. Practical Theology as Transforming Practice: Elaine Graham (University of Manchester). 8. Interpreting Situations: An Enquiry into the Nature of Practical Theology: Edward Farley (Vanderbilt University). 9. Practical Theology as a Theological Form: Emmanuel Lartey (University of Birmingham). 10. A Basic Introduction to Theological Reflection: Stephen Pattison (Cardiff University). Part III: Relating Theory and Practice to Perspectives and Issues in Pastoral and Practical Theology:. 11. Pastoral Theology and Sociology: Michael Northcott (Edinburgh University). 12. Liberation Theology and Political Theory: Peter Sedgwick (Church of England's Board of Social Responsibility). 13. Ecclesiology and Pastoral Theology: Nicholas Bradbury (Diocese of Bristol). 14. Christian Morality and Pastoral Theology: Nicholas Peter Harvey. 15. Spirituality in a Post-modern Era: Marie McCarthy (Centre for Religion and Psychotherapy of Chicago). 16. Sketching the Contours of a Pastoral Theological Perspective: Suffering, Healing and Reconstructing Experiencing: Chris Schlauch (Boston University). 17. The Relationship between Pastoral Counselling and Pastoral Theology: Gordon Lynch. 18. How Sexuality and Relationships have Revolutionised Pastoral Theology: Bonnie J. Miller-McLemore (Vanderbilt Divinity School). 19. Culture Religious Faiths and Race: Martin Forward (Wesley House). 20. What is the Relevance of Congregational Studies for Pastoral Theology? Brynoff Lyon. 21. Towards Dialogue: An Exploration of the Relations between Psychiatry and Religion in Contemporary Mental Health: Mark Sutherland (Maudsley Hospital). 22. Management and Pastoral Theology: Stephen Pattison (Cardiff University). Part IV: Evaluating Pastoral and Practical Theology: . 23. An Introduction to an Evaluation in Pastoral Theology and Pastoral Care: Stephen Pattison (Cardiff University) and James Woodward (Foundation of Lady Katherine Leveson). 24. A Pastoral Carer's Performance: David Lyall. Presents pastoral and practical theology within a theoretical framework. Contains classic readings together with newly commissioned articles. Engages with practical theologies from both sides of the Atlantic.